Because of its warm and welcoming looks, fine hardwood flooring has been the foundation of residential living for centuries. Beauty and durability along with the fact that wood is a renewable resource adds to its attraction as a flooring material. Using hardwood from sustainable and renewable sources, will add the best modern techniques to the beauty of nature. Hardwood is easy to install and designed for stability, strength and long-lasting resistance to stains and scratches. And after years of use, these environmentally friendly floors can be removed and reused or recycled. Although hardwood floors cost more than some other types of flooring, but it will bring positive value addition to your property and in most cases last much longer than softer flooring materials like carpet. Basically there are 2 types of wood flooring construction available, Solid Hardwood & Engineered Hardwood. Solid wood flooring is 100% hardwood milled from one piece of wood, solid wood floor boards are generally three-quarters of an inch (3/4") thick. Solid hardwood can be installed above or on grade, but you don’t want to install this type of wood below grade, since moisture makes it expand and contract. Hardwood is a natural material, solid hardwood reacts to changes in its environment, like moisture and extreme temperatures, which cause solid wood to shrink or expand. Remember if even part of the area you’re finishing is underground (like a walk-out basement) it is considered below grade. Hardwood flooring is not suited to install below grade level or in other areas where it may be exposed to moisture. 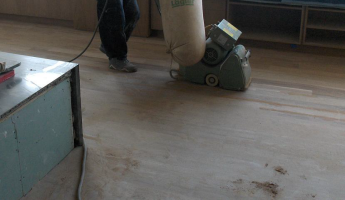 All solid hardwood can be sanded and refinished many times over the years. Engineered wood floors constructed and built up with multiple layers of cross grain that are bonded together. It consists of three to ten layers, called plies that are glued together. The upper layer is made of a real wood selected from various species. The lower layers are made of different types of wood and it could be natural wood or man-made wood like plywood. This multi-ply structure gives engineered wood superior stability, much greater than solid hardwood, which reduces shrinking and expanding when temperature and humidity change. The grains in each successive layer have a different orientation making the wood more stable and less prone to warping. Stability is the biggest advantage of an engineered hardwood over the solid wood floor, thus it could be installed Below, On or Above Ground Level. Engineered hardwood same as solid wood is available in pre-finished or unfinished, and can be find in all known species used in hardwood flooring industries along with many different finishes such as urethane finish or Oil Finish. Engineered wood floor depends on its construction and dimensions can be direct glue-down, nail, staple or floated. Some engineered woods are also available in click and lock systems. Floating engineered wood needs to be installed directly over an underlayment, like cork flooring underlayment. Poor constructed engineered wood floors use substandard glues that may contain volatile organic compounds. These cheap wood floors will emit VOC’s for years. Engineered wood made from cheap glues or made with poor quality base layers is likely to unravel in the blink of an eye. It is also better to visit a physical store and get a first hand idea of the appearance and finish of a floor instead of relying on online pictures. Let's be responsible and buy our hardwood floor and any other wood products from a reputable manufacturer and retailer. Carpet Floor & More, Inc. is proud to be the authorized hardwood dealer for most those reputable manufacturers. For fine hardwood floors, hardwood design ideas and hardwood installation consultation, visit our Los Angeles floor covering showroom where we carry high-end commercial hardwood floors and residential hardwood floors with many choices and patterns to choose from. Bring the natural beauty to your home decor with our designer choice of the latest stylish wood flooring, from strip solid & engineered hardwood to wide planks, long lengths and long strips wood floor. Experience how design, technology and sustainability work inunison across our selective products. Carpet Floor & More has been installing hardwood flooring in Los Angeles and North America since 1987 and completed numerous hardwood floor projects with 100% satisfaction. Carpet Floor & More also sells hardwood floors in Los Angeles and other parts of North America. Our installation services are available in many cities of USA and CANADA. Basically there are 3 different ways of installing hardwood floors, Nail Down or Staple Down, Glue Down and Floating method of hardwood installation. In this method of installation hardwood installer will attach each harwood strip or hardwood plank to the wooden subfloor (plywood sub-floor in most cases) using pneumatic nailing gun or pneumatic stapler by driving nails or staples through the hardwood. First row will be top nailing installation (using hardwood glue is also recommended while top nailing), then blind nailing soon after. In blind nailing, nails or staples will be shoot to the hardwood in about 45 degree angle at the top of the tounge where tounge is attached to the board. 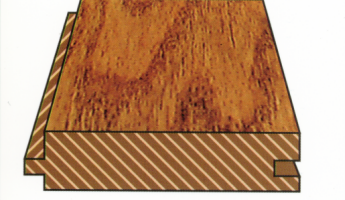 The cleat of nail or crown of staple will sink slightly beneath the surface of the hardwood and will not impede a tight fit when installing the next row of hardwood. 3/4" solid hardwoods are normally installed using nail down or staple down method. 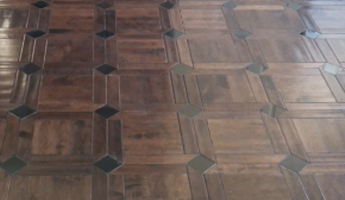 This method can be used for installing engineered hardwood to wood subfloor as well. *Please note that solid hardwood flooring should only be installed on wooden subfloors when it is on or above grade. In glue down hardwood installation, floor boards are glued to the sub-floor using a recommended adhesive. This method of hardwood installation is for engineered wood flooring and some 5/16" thick solid wood flooring and solid perquet floors. The recommended adhesive is spread on the subfloor (wooden subfloor or concrete subfloor) with the proper sized trowel to adhere the hardwood flooring to the subfloor. Engineered wood floors and parquets can be glued down. There are many types of adhesives on the market and they are relatively expensive. *Please keep the newly installed hardwood from foot traffic for about 10 hours to allow proper adhesion. In this type of installation, hardwood floor is not mechanically attached to any part of the subfloor, instead engineered hardwood floors are glued or clicked together and laid over a thin layer of underlayment. When the planks are not in click system a bead of recommended wood adhesive is applied in the groove of each plank to glue the planks together. The underlayment placed between the wood flooring and the subfloor to provide a cushion and moisture barrier, preventing moisture from seeping back up from the sub-floor into the hardwood for extending the life of the hardwood floor. Only dimensionally stable hardwood can be floated, floating hardwood must have the right dimensions such as width, length, thickness and also the construction. Carpet Floor & More, Inc. will not use floating method of installation on many hardwood floors even if it is recommended by it's manufacturer or supplier, when the boards are not qualified under our descretion. With over 25 years experience, Carpet Floor & More beleives that only and only wide planks and long planks of engineered hardwood flooring will provide a successfull floating installation. Wood is hygroscopic material and, it will absorb or release moisture until in equilibrium of its surroundings. *Gaps may occur due to change in seasons and/or changes in humidity. *Wood will not swell or shrink equally; this may cause gaps in some areas of the floor and not in others. *Gaps may be more excessive around vents or above the home’s heating system. *Excessive moisture may cause cupping of a wood floor, although a small amount of cupping can be accepted as normal, especially in wider widths. 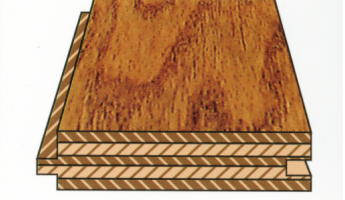 *Plank floors (3”-8” width) will expand and contract to greater degrees than strip flooring (1 ½”-2 ¼ “). *Some species of wood may expand and contract more or less depending on the “stability” of the wood. *All species of wood differ in stability characteristics and hardness. The Janka Scale is a measurement to determine the hardness of woods. In new installations, Carpet Floor & More takes as many steps as possible to secure the existing sub-floor to prepare it for a good installation; however in existing floors, squeaks may be difficult or not possible to fix.